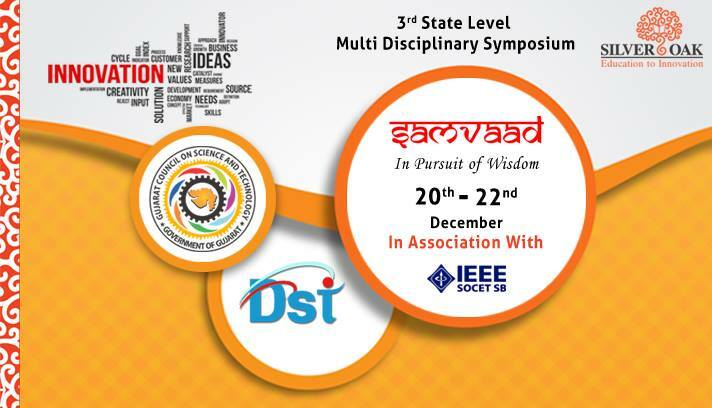 Silver Oak Group of Institutes is going to organize “SAMVAAD 2017”- Three days state level Multidisciplinary symposium during 20th to 22nd December 2017. “SAMVAAD 2017”- aims at providing opportunity to young academicians and professionals to improve their knowledge and awareness of the most recent technologies and contribute in bringing about innovation in their respective field. The symposium not only includes thought-provoking sessions and discussions at the three days seminar but there will be demonstrations, workshops and hands on sessions to enhance the knowledge of participants in the core areas. We have got eminent and insightful speakers for our enlightenment and knowledge in varied fields. Encourage your friends or family members having technical background to participate.